Okay, so how stinking cute is Mollie King? I have adored her style far before I even knew who she was and now I can thank E! for putting my fash crush into overdrive. While Mollie looks uh-mazing in everything she wears, I've recently taken notice of her insane shorts collection, which lets face it, I'd totally kill to be able to pull off. From denim to leather, no pair of shorts are off limits for this flawless British beauty. Which pair is your fave? 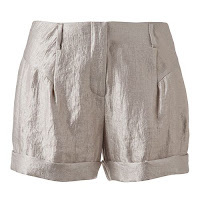 Below are some Mollie King worthy shorts perfect to accompany your spring wardrobe. Click the picture to shop the look! Great inspiration, I love her outfit! She has got definitely the legs for shorts! I adore shorts for whole year looks...summer or winter...it doesn't matter! Today I'm going to publish a new look with Leopard coat.....and more amazing pictures of FALLAS!!!! (one of the greatest festivities of Spain). You can't miss it! A GREAT STYLE!! !lOVE THE GREY SWEATSHIRT LOOK! I love her outfit too and her style. Thanks for sharing Molly King's amazing fashion. She dress fantastic. If you get a sec, check out my latest post - 'In the Tropics'. She's really popular here in the UK. Great relaxed style. she is a great inspiration !!! Thanks for sharing ! If I had her legs, I would rock shorts 24/7 too! Great choices to shop the look. Wow that girl can really pull off a pair of shorts! I love those printed pink ones, super cute. Ah! She even makes a sweatshirt and denim jeans look posh. Love that. I love her style, too! She has the cutest personality on their E! show, and it translates into her wardrobe! She is the perfect mix of fun and classy. How adorable are all those shorts? Love her style, definitely some great looks there for summer months! She's adorable...wish I had legs like that! LOL Can't wait to bust out the shorts once it gets a bit warmer! She does have great shorts and great legs to wear with them. I am loving the short choices you gave to us. 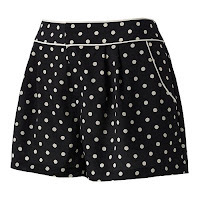 Those polka dot/lace ones are super sweet! her short collection is killer! Molly King is a great fashion inspiration and a role model in general, I love her personality and her outfits really reflect it!! Love her style !! the 3rd picture & the leather & the one where she carries a Victoria's secret bag are my faves !! Love dressy shorts!!! Love her look. Fabulous. Can't wait to be able to wear them. Hey legs are miles long! She always looks fantastic. I love the navy shorts with the leopard! It looks awesome. Doubtful it would look the great on me, though ;). I've been looking for some cute short options! thanks for the ideas! She looks amazing in them all but my faves are the first outfit w/ the stripe shirt and the pink short suit. She s absolutely amazing!!! I wish I had her gams! Her style is so cute, I love it! Those shorts look amazing on her! The girl can rock a freakin pair of shorts. No doubt. I'm definitely a shorts girl! It's so great to see I'm not the only one. There are definitely ways to make them work for any occasion and look chic. Ah ok now I also know her name. Her look is really pretty and I love how she wear short pants. Have a great thursday pretty Anna. I love Mollie King, her style is amazing! Love her style. I'm a huge fan of shorts especially super fun ones like these. Mollie is just super cute! With legs like those I'd wear shorts everyday! My fave pair would have to be the first ones! I have always loved her style too! Not too sure who she is though. lol. But she sure can rock a pair of shorts! Her style is insane. Love it. Wow!! I didn't know about her! And she is so my style! All those looks in shorts are a great inspiration for me! So, thanks for sharing! I just love her! She's adorable. She is gorgeous and oh how I love shorts , its my wardrobe staple . She's pretty cute! I wish I could pull off shorts like that, but oh well. 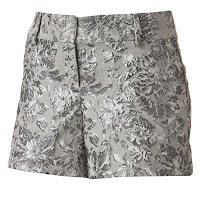 Definitely obsessed with those lovely brocade shorts! She's so adorable. I love that she's always smiling! Wow, I wish I could pull off every pair of shorts like that. Such a simple & cute staple! Coming from Vegas, it's important to have a closet FULL of shorts. I am so jealous of this girls, legs and shorts collection it's actually insane!